I'm like a junkie. When I fall off the wagon, I fall off big style. So anyway, I missed one day of my January blog-daily challenge, and then the next and the next, etc., until I realise many days have passed and I have nothing exciting or noteworthy to return from my silence with, so I go to bed instead. But I'm back, and I'm gonna stay back. To get me back on track, I'll ease myself in with something short, sweet and simple that allows me to quickly afterwards finish up my chore schedule duties for the day and hit the sack before midnight. 1. Put more junk on ebay. 2. Get living room spick-n-span. 3. Stick to the diet and lose another pound. 4. Submit poems to that poetry competition I've been dithering over. 5. Clear out another bag of unwanted stuff and take to charity shop and/or destructor. Simple, achievable goals. 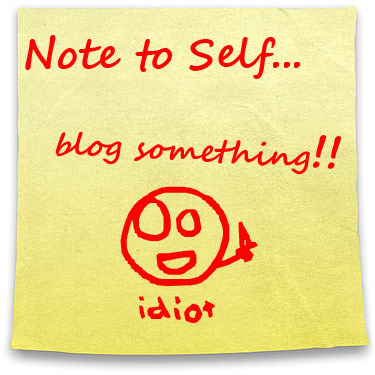 And a simple, achievable blog post to get me back on the wagon. "Life in perfect balance," as my character in an upcoming play would say. "Focus on the core, breathe in, tilt the pelvis, and tighten. TIGHTEN." That's what Sonya would say.